You might be thinking, “How do I get to the top of Google search results for my website”? Or maybe the question revolves around how to improve your Google rankings to increase leads and revenue for your business. While there is no Google page 1 guarantee in SEO, I’m going to share my steps that I took to get to position 1. Numerous factors play a role with ranking in Google, so this should be an outline to consider with your strategy. My client found me on, you guessed it, a Google search. Almost all contact for TM Blast come from organic search, so I don’t pay for those leads. After the initial email contact, we (client and I) spoke on the phone about his business. 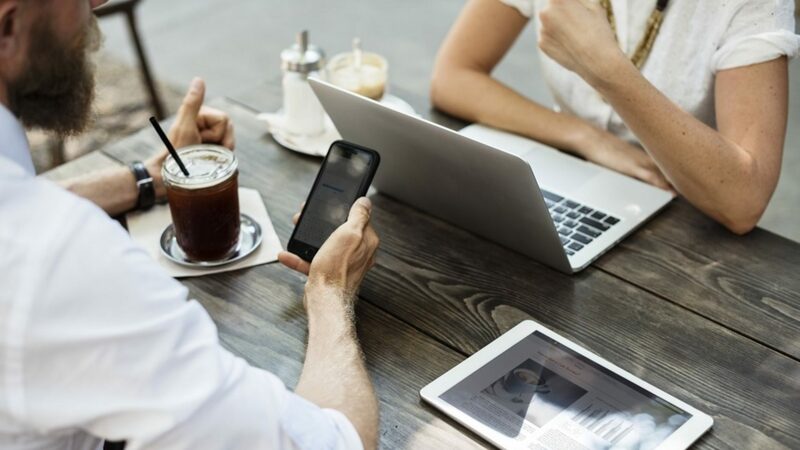 The goal in 2019 was very clear that organic search would be critical to growing their presence and they wanted me to help. Once the contract was signed, I spent the first few days of the deal learning about my client’s industry. To help learn, I read reviews, analyzed competitors websites, and read how the app would work. I also spent time reading up on customer reviews of the app industry in Apple and Google stores. Indirectly, I believe taking this time made me understand what was needed from me to help achieve reliable results for their site. With the basic understanding of the industry complete, I ran a full SEO site audit for my client for documentation. Documenting historical keyword rankings, technical issues, and any other areas of concern would help point me to my first optimization. As a note, I create this report because I use this as a before and after when I create my first monthly report for clients. Setting up a project dashboard in SEMRush is the next thing I do for clients. SEMRush is my primary SEO tool due to the amount of insight I can receive into a website. Setting up daily keyword tracking for select keywords is the first thing I do for clients. I will use this report to track my progress of achieving top keyword rank positions. SEMRush also has a site health report that gives a basic (ish) view of a site from a technical standard. Missing elements like sitemaps, canonical tags, duplicate content and more are a handful of features that the tool can provide. Technical SEO needs to be a focus for every strategy because fixing these limitations will set your keyword rankings up for success. Many technical issues on the site were going to limit any future optimization regarding keywords. Some issues dealt with duplicate content, zero canonical tags, spam meta name keyword tags, and more. Bing had some issues as well when it came to the site, but for this post, I’m going to stick with Google. If you are looking for Bing SEO tips, I recommend checking out that guide. I requested my client to send over their Google Ads search query report for me to review.Seeing the keywords that drove clicks is important for me to know. Learning what queries people are converting on is even better. I took that keyword information to help share my on page SEO strategy in the next steps below. With the technical changes made and the AdWords search query data analyzed, I began the on-page SEO changes. To start, I rewrote the title tag to include the primary keyword at the start of the tag. I know that Google and Bing give a bit more weight to the beginning of the title tag, so I felt this small update could make a big difference. As the weeks went by, I saw an immediate improvement moving from page two to page 1 in Google. I saw the impact directly in Google Search Console with impressions and clicks jumping for this keyword, so I knew I was going in the right path. If you are curious what the expected click-through rate would be for achieving this result, I recommend checking out this link. My optimizations for clients fall within the wait, review, and tinker stages. Technical changes and on page fixes could be too much too soon, so I let the results stabilize before attacking again with optimizations. Seeing the target keyword move to the middle of page one of Google and stay there for a while gave me confidence that we were in the right place. Time to tinker with a bit more aggressive tactics to improve the rank even further in Google. To tinker the page, I began optimizing the header tags on the page. I also started adding more semantic keywords on the page to help give more context to Google that this page was about this topic. I spent time using Google’s answer box results, related questions, answer the public, and more to find keywords to use on the page. SEMRush has an On-Page SEO section where I was able to use the TF-IDF report to see more terms to use. Image optimization was the final element of the strategy. Images can make up a larger share of traffic for specific websites, so it’s important to work on that aspect as well. By changing the file name and ALT tag, I knew we’d given Google everything to rank better in image search. As a note, we don’t have an image XML file, but that is something I recommend to clients as well. My primary focus is on web optimization, not images, but I know that image XML files can be lucrative to certain websites. If your site relies heavily on pictures, you may consider adding that to your strategy. A stabilized keyword ranking of position five began to change to four. Then four went to three and so on and so on. Finally, we got to position 1, and we’ve kept that position! This entire process took about two months to achieve, so I’m happy to see results like this! I met with my client to go over these results recently, so it was one of those rare meetings where everything was going well! Below is a picture from Google Search Console showing the increase in daily clicks due to moving to position 1 in Google. A stabilized keyword ranking of position five began to change to four. Then four went to three and so on and so on. Finally, we got to position 1, and we’ve kept that position! This entire process took about two months to achieve, so I’m happy to see results like this! I met with my client to go over these results recently, so it was one of those rare meetings where everything was going well! The picture above made me feel awesome to be honest. A lot of hard work was spent moving their position from page two to page in Google, so seeing their excitement felt great!There are no guarantees when it pertains to SEO. 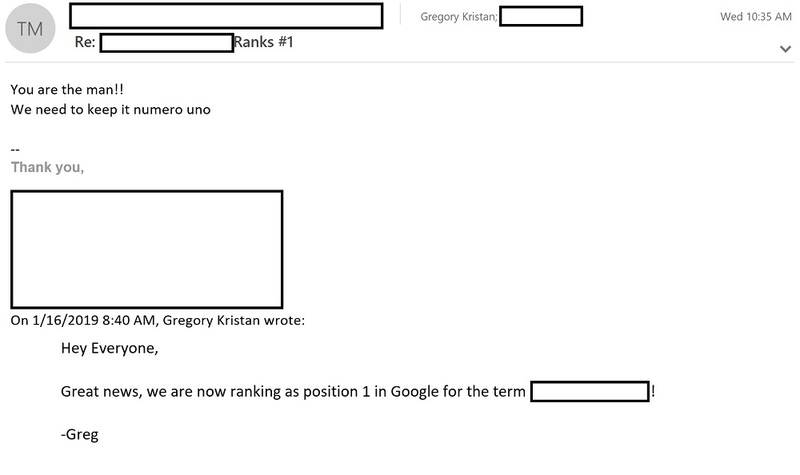 Ranking as the top position in Google does not mean you automatically keep that rank forever. Continuous analysis, optimization, and more are all requirements to keep top ranks in Google. Outside elements play as a factor as well with ranking in Google. Google continually updates their algorithm and tests different results, so you may see your ranking fluctuate all the time. My main takeaway is that you need to be increasing overall traffic and overall visibility to have a successful SEO project. As a note, my client is not ranking for that term in Bing. Bing takes more time to grade because they have some technical issues on the site. However, I know that achieving this top position in Bing could drive an additional 5 to 10% more clicks to the website just from that alone. If you are looking for SEO Services, you can contact me right here!